The story of the UAE is testament to the power of collaboration. In its short history, our nation has grown to become an international hub for business and culture, demonstrating what is possible when people come together to share ideas, solutions and visions for the future. On the UAE’s 47th National Day, we celebrate the union of the Emirates and reflect on almost half a century of progress. At Expo 2020 Dubai, we understand that the spirit of entrepreneurship has played a crucial role in our nation’s success story. As we aim to create a further longlasting economic impact, we are working with companies of all sizes — especially SMEs. There are less than 700 days to go until the Expo’s opening ceremony, but the global destination is already providing tangible benefits to SMEs and entrepreneurs across the UAE and beyond. In line with our belief that these companies and change-makers represent the backbone of our economy, Expo 2020 has committed to allocating 20 per cent of its direct and indirect spend to SMEs. Of the 4,500 contracts the Expo has so far awarded, more than half have been won by SMEs. We have launched several events that enable us to support, engage with and learn from SMEs, including our Meet the Buyer and BusinessConnect series. Companies can also unlock new business opportunities, forge international partnerships and drive growth by registering on our new Online Marketplace (OMP), which offers an opportunity to connect with companies from the World Expo’s global business ecosystem. Our eSourcing Portal, a platform that lets users bid for Expo-specific procurement opportunities, already has more than 25,000 companies registered to do business with Expo 2020. Expo 2020’s relationship with the UAE business community is based on reciprocity. For example, our licensing and merchandising programme will provide valuable exposure and business growth opportunities, spreading the economic benefit of hosting Expo 2020. We aim to have on sale about 5,000 official licensed products, some of which will be produced by Emirati SMEs. We’ve already joined forces with a number of local SMEs to develop high-quality Expo-branded products for our millions of visitors. These include Caliente, a company that creates colourful trucker hats and other forms of apparel; Karam Coffee, an Emirati-owned SME that aims to share Arabic coffee with the world; and Mirzam, an Al Quoz-based firm that is creating artisanal chocolate bars especially for the World Expo. Beyond the additional sales that our licensees will receive, the exposure that being associated with the Expo is expected to create will help them continue to grow well after 2020. UAE companies can also capitalise on the international consumer base by collaborating with Expo 2020 as authorised retailers. Licensed products will be sold through outlets across the Expo site as well as by retailers around the UAE, and our official online store will offer an additional opportunity for local firms to reach customers in every corner of the planet. These economic benefits will only intensify during the six months of the event, providing local firms with international exposure. More than 200 participants including nations, corporations, NGOs and educational institutions will take part in Expo 2020, and we expect to attract 25 million visits between October, 2020, and April, 2021. Expo 2020 is also an opportunity for the UAE to showcase its renowned hospitality and we intend to do that with the help of local food and beverage firms, who will have the opportunity to serve their fare to the world, as well as our official hotel and hospitality partner, Emaar Hospitality Group. Expo Live, an innovation and partnership programme launched by Expo 2020 to provide funding, guidance and exposure to innovators whose creative solutions are improving lives, preserving the planet or both. Make no mistake — the next World Expo represents a major commercial opportunity for businesses across the Emirates and beyond. In addition to being a catalyst for economic growth, we see our nation’s entrepreneurial spirit as a force for good on a global scale. This is why we are supporting social entrepreneurs through Expo Live, an innovation and partnership programme launched by Expo 2020 to provide funding, guidance and exposure to innovators whose creative solutions are improving lives, preserving the planet or both. Expo Live is already backing several UAE-based projects, ranging from a mobile app that helps blue-collar workers improve their reading and writing skills, to a telemedicine programme that is enabling radiologists in Ethiopia to train others. The benefits of the next World Expo will live on long after 2020. 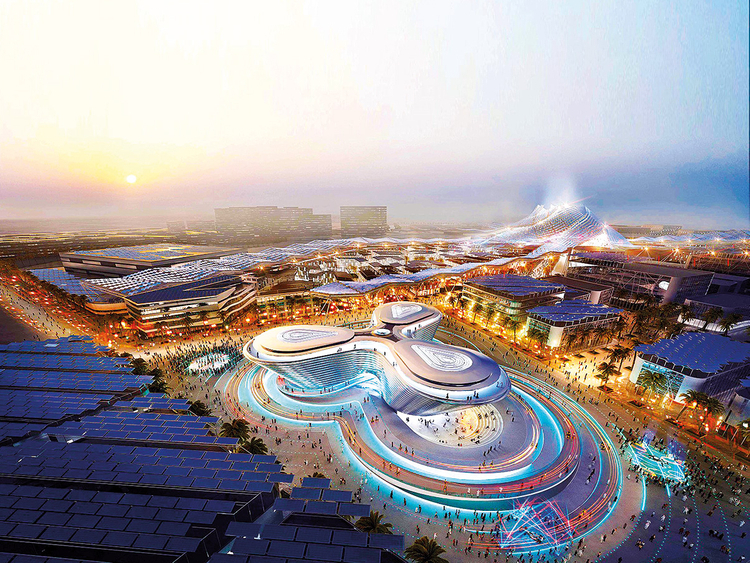 At least 80 per cent of the Expo’s built environment will be transformed into District 2020, a future smart city that will continue to support UAE-based SMEs and entrepreneurs for generations to come. One of the most connected and tech-enabled destinations for working, living and exploring, District 2020 has been planned to create a collaborative and innovation-driven business ecosystem. This world-class integrated hub will build on the legacy of Expo 2020 and facilitate the acceleration of our nation’s future development. It will focus on strategic economic areas, as idenitified by our leadership: logistics and transport, travel and tourism, construction and real estate, and education. Expo 2020 will be a historic event of national importance. Running until April 2021, it will coincide with the golden jubilee of the UAE, a country whose rapid development has continued to redefine what is possible. In line with its theme of Connecting Minds, Creating the Future, Expo 2020 is an opportunity to inspire and support the next generation of business leaders, catalysing innovations and ideas that will underpin the next 50 years of national progress.